Item #C-QY1: Set of three approx. 3"x3 1/8" tall Cloisonne Sweater Ornaments. 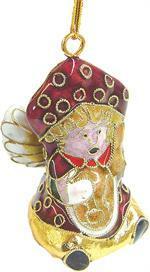 Item #MZ-35: 2"x2.75" Cloisonne angel bell ornament. Our seated angel is garbed in a deep red suit and an elaborate hat. Her puffy wings are accented with gold and red. 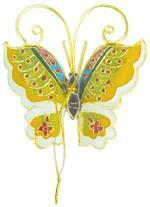 Item #CX-4267: 3 1/2" x 3 1/4" Cloisonne butterfly ornament. Various colors and patterns. 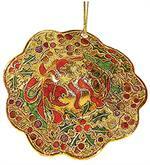 Item #C-QY14-2: 3.75"x1.25" Cloisonne hat ornament with gold, red and green enamels. 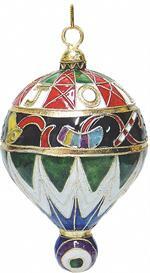 Item #C-6: 2.5"x4.5" tall Cloisonne Hot Air Balloon Ornament with assorted backgrounds, enameled colors and designs. Christmas hollies grace the sides. Item #L-30SS: 2"x5" Cloisonne Mary & child ornament. Item #MFD-313: 2"x5.5" tall, Cloisonne Snowlady with Dangling Feet Ornament. Our whimsical snowlady is dressed in a pink hooded jacket and pink boots. Bright beads form her legs.